Morning. Non complaint: four day weekend. Complaint: Waah is a little cool so far today. ...from what I've seen of the advance Melbourne forecast, in a couple days you'll be wishing for cool. here we will be lucky if we make the upper 40s. While on the weather site during lunch viewed the photo gallery for Melbourne. Nice looking city with some really neat architecture (love the Webb Bridge). In one night pic taken along the Yarra it didn't look too different than here in Portland along the WIllamette, though you have a couple taller skyscrapers than we do. Also love Flinders Station. 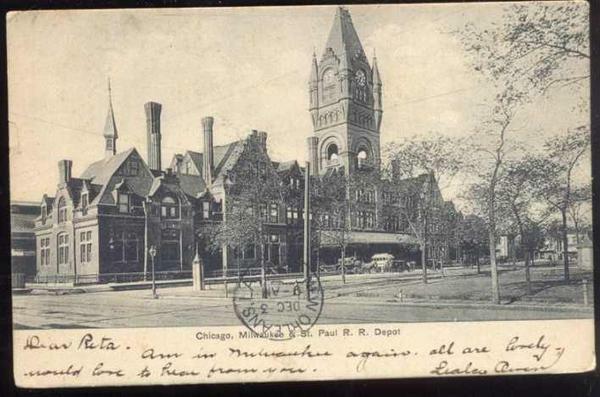 We used to have a really neat Gothic styled station on the lakefront (Lake Michigan) in Milwaukee WI where I grew up (see below) but nothing as grand as Flinders. Unfortunately it was raized in the mid 60s in the name of "progress" and a lakefront expressway that was never built. Seems that power kiting and kite boarding is also quite popular there. You must get some really good winds. ...well finally made it. Four days of not having to think about the workplace and all the associated politik. Very light day today (most of my client's personnel took off early for the holiday here) so was able to get out a bit early and get a ride home saving about an hour and a half on the commute. Currently at the neighbourhood pub enjoying a pint of CatDog on 2.50 pint night (every Wednesday all ales are 2.50$ a pint all day until close - and this is of fine handcrafted brew). The nice thing is I don't have to get up at 05:45 tomorrow so I can stay until time is called. Hey what a great ol railway station with a cute turret. Flinders St Station has an old ballroom inside, is very luxurious but fallen into disrepair. Old Melbourne was built during a gold rush mining boom and new Melbourne during a iron-ore mining boom so lots of public stuff is way lavish and even a bit controversial to the average laconic Aussie, I guess generations need to put their stamp on the future. The best thing about the gold rush guys was a fascination with parks and gardens and trees everywhere, newer skyscrapers have elaborate rooftop hanging gardens I guess to fit in with tradition. Strange in a city where it doesn't rain much but I guess that's the transformative bit of civilisation in action. I hope I can sleep well tonight. ohmygoodness, searching on Orion Dancing girls from work compy, not a good idea. it's a genre all by itself. At least we got shooed back home early today. yumma yummayumma day. waiting for the dinner bell :D. still several hours away yet. or one of my hot topic micro skirts with black tights. the skirt has give, but the tights are tight. hmm, the thanksgiving wardrobe dilemmas. i hope my cuzzie doesn't have Sleeping Beauty already, or i'm an empty handed guest. Stepfather keeps trying to micromanage everything. disney is short on ebil stepfather movies. i'm temped to slap any old render on a zazzle mug just to start my store. but first i haz to find the templates for mugs. oh noes, Noodles kitty is on sale. ouch. can't spend money on myself this week. iz Holidays. they're on their way to come get me. can yoo tell i don't get out much? brr, iz chilly, need last minute change of wardrobe plan. Had some food. Now I want to rest now. That looks like a Jack (Tomalin) scene, KK (^_^). ...I actually posted this in the JT Appreciation Thread. He liked it. I hope he does something like this sometime. ...like a bear, I could do so until next spring. Winter, used to love it, then I got old and achy. That's the "Lake Front Depot", isn't it? Do you have any other pictures of it, or just memories? I am tired but I do not want to take a nap. ... ah... hmm... not all threads - Rezca's inline images in the final complaint thread still seem to be gone... but a bunch of other random threads I tried now seem to have pictures ^_^. Morning. Grey day in Melbourne, where haz the sun gone ? ...most of it fond memories. Used to take trains out for there to Green Bay & Chicago until the C&NW; moved to the station they shared with the Milwaukee Road on St Paul Ave. The Milwaukee Road had an imposing terminal as well, very "German Bahnhof" in appearance. Unfortunately it first had it's magnificent clock tower removed then after the Milwaukee Road abandoned it the building burnt down. Unfortunately the only image I have from its heyday is an old postcard. grr am i calling it wrong? i can't find smudge sticks on amazon. you know those cardboardy stick thingies you use to smudge lines in pencil drawings for contouring?